Inglis Methodist Gardens will be an inclusive community of 47 accessible, affordable and technologically-enhanced apartments, located on the campus of Methodist Services in the Wynnefield Heights neighborhood of Philadelphia. Developed by Inglis and Methodist Services. Inglis Methodist Gardens will be a new housing community that understands the connection between housing and health and is designed to provide supportive housing to people living with significant physical disabilities and to families and individuals seeking to avoid homelessness through stable, supportive housing. In collaboration with community health providers, residents demonstrate improved health outcomes. The powerful partnership between Methodist Services and Inglis will distinguish Inglis Methodist Gardens from other affordable housing communities. 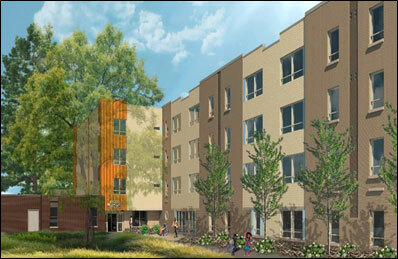 Recognizing the role of safe, affordable housing in improving health outcomes. Supportive services to provide significant resources for residents, including safe child care, behavioral health services and access to Methodist’s unique urban farm. 23 of the apartments will feature Smart Home technology and Inglis Accessibility Plus design specifications, maximizing independence for wheelchair users. Located on Methodist’s beautiful 22-acre campus provides ready access to public transportation and a full complement of shopping options within convenient walking/rolling distance.